I recently planned a fun oyster roast shoot for the Holy City Chicks, a rotating group of stylish Charleston fashion and lifestyle bloggers. After checking the dismal forecast, I frantically emailed/begged everyone the night before to put on some cute rain boots and come out anyway. The show must go on, and I can’t say I would have had it any other way. There is nothing like creating your own sunshine with your most colorful ensemble to really perk up a rainy day. The rain really starts to get to me if it’s gray for too many days in a row, but as Liz Taylor said, “Pour yourself a drink, put on some lipstick, and pull yourself together”! That we did, with some help from Blue Chair Bay Rum. That key lime pie rum is OOC good! I’ve linked my favorite rainy day accessories below, and some of these links are affiliate links. I really appreciate you purchasing these items through these links to help keep this blog up and running! The sun almost always comes out in Charleston, so we changed from See Eyewear glasses to sunglasses as the day went on. 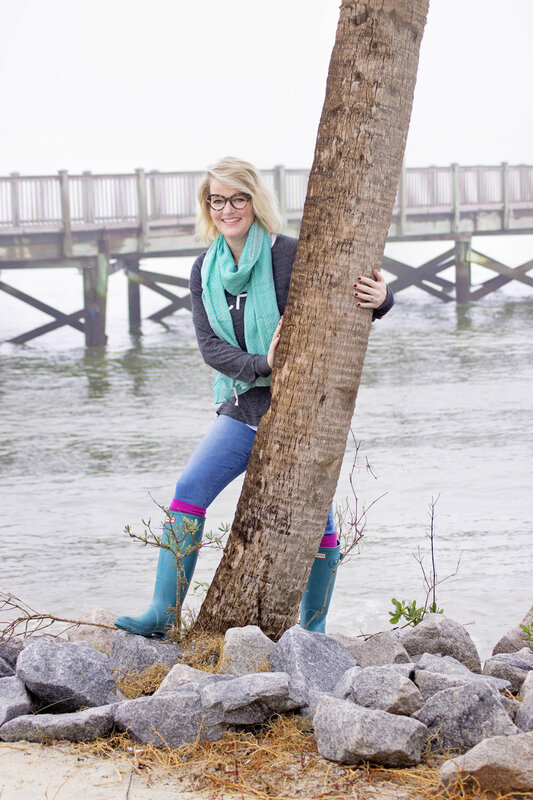 We added some splashes of color to our outfits with Charleston Krewe scarves. Thank you to the fabulous Holy City Chicks! (pictured below,L-R) @xoxoijoelle, @mycoastalchaos, @charlestonweekender, @keylseyjhill, & @tlbecca. Follow me on Instagram to see more from The Holy City Chicks, and for an overdose of weekend-inspired fun!